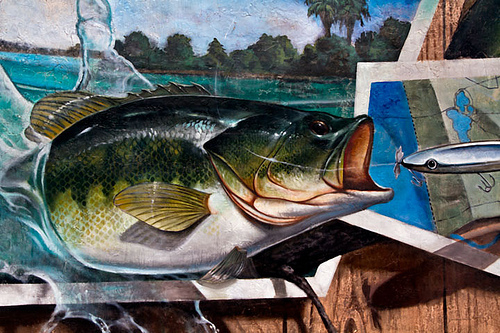 Lake Placid, Florida has, over time, become known as "The Town of Murals." Harriet and Bob Porter, founders of the Lake Placid Mural Society, look over 20 plus years of the Lake Placid Mural Society. During a motorcycle trip to Chemainus British Columbia, the Porters saw 32 historic murals. 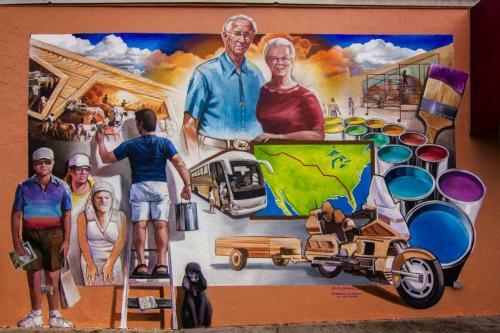 They brought that idea back to Lake Placid, and now there are 47 historic murals in town. 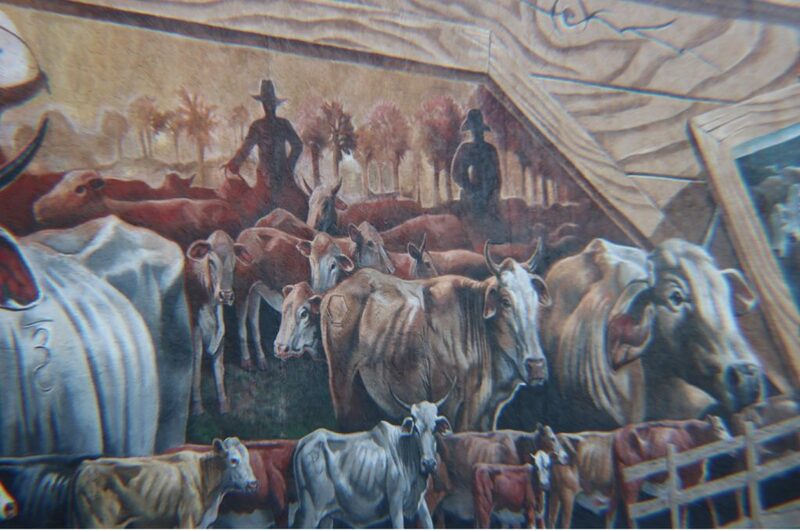 Since then, the mural society added 146 pieces of artwork through town including the murals. Tourism increased and has had a positive economic impact. In 2013, Lake Placid won the coveted award of "America's Most Interesting Town", in a nation-wide search by Reader's Digest. Lake Placid is truly a jewel in the crown of Highlands County. Sponsors arranged the above mural as a surprise for the Porters and as a thank you for their decades of service to the community. In 2013, Reader’s Digest voted Lake Placid ‘AMERICA’S MOST INTERESTING TOWN’. We are very proud to have this title, and it inspired this beautiful mural ‘Celebrate Lake Placid’. It has been written that “When God finished creating flowers; he turned a flower into a leaf”. He must have been referring to Caladiums. Growers imported Caladium tubers from the Amazon River Valley of South America around the 1920s, and found they thrive in the rich black muck along the shores of Lake Istokpoga, on route 621, in Lake Placid Florida. It was in the 1950s that several growers made caladiums a big business in this area. There are over 1,000 acres dedicated to the growing of caladiums, and this has earned Lake Placid the proud title of Caladium Capital of the World. Thousands of people visit each year to see our 47 beautiful internationally known historic murals. Our 17 one-of-a-kind trash containers are all companion pieces to the murals. Lake Placid has so much more to enjoy. Toby's American Clown Museum takes you back in time, and brings back many happy memories of our favorite clowns. You learn about the art of clowning. The Caladium Arts and Crafts Cooperative is in a 10,000 sq. ft. building filled with fine arts and crafts. A great place to shop for that unusual gift.